Sir Walter Raleigh’s Lost Fort Found? For those familiar with the Lost Colony mystery and saga, you’ll know that the location of the final destination of the colonists has been debated for literally centuries. You can read more about the background at the website www.lostcolonyresearch.org. In an announcement made May 3rd, it appears that Sir Walter Raleigh’s lost fort may indeed have been found. This story has all the elements of a good mystery, intrigue, lost clues, hidden maps, invisible ink and messages delivered long after the death of the sender – 425 years to be exact. It’s as if John White is speaking to us from the grave, revealing the secrets that he kept, or at least tried to conceal. He did a fine job of that too, almost too fine a job in fact. 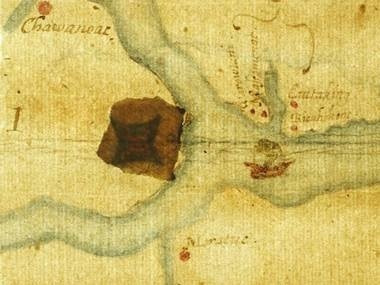 Recently a hint found on an old map may indeed tell the story of where Raleigh’s mysterious fort was placed when the colonists moved “50 miles into the Maine.” Or maybe, this is where they planned to go, but never went. Now, a clue has emerged that experts hope could help solve the centuries-old mystery of the settlers’ disappearance, and lead them to the site of what Raleigh and Queen Elizabeth I hoped would be a capital, the first English attempt at colonisation. 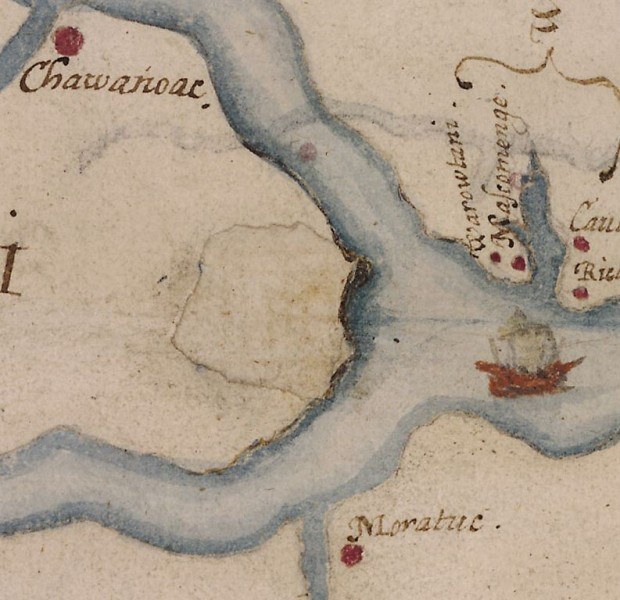 Shown on the photo above, on one of John White’s maps of “Virginia” in the new world is a hint drawn in what appears to be invisible ink, further disguised by a barely-discernible patch of paper glued to it. Scientific tests have revealed that a lozenge, the symbol for a fort, was hidden on the map drawn by John White, who accompanied Raleigh’s first attempts to establish a colony. Its concealment on the map reflects an age mired in political intrigue – Elizabeth I was then facing plots to place the Catholic Mary Queen of Scots on the English throne – and fears of such a map getting into the hands of court spies were rampant. 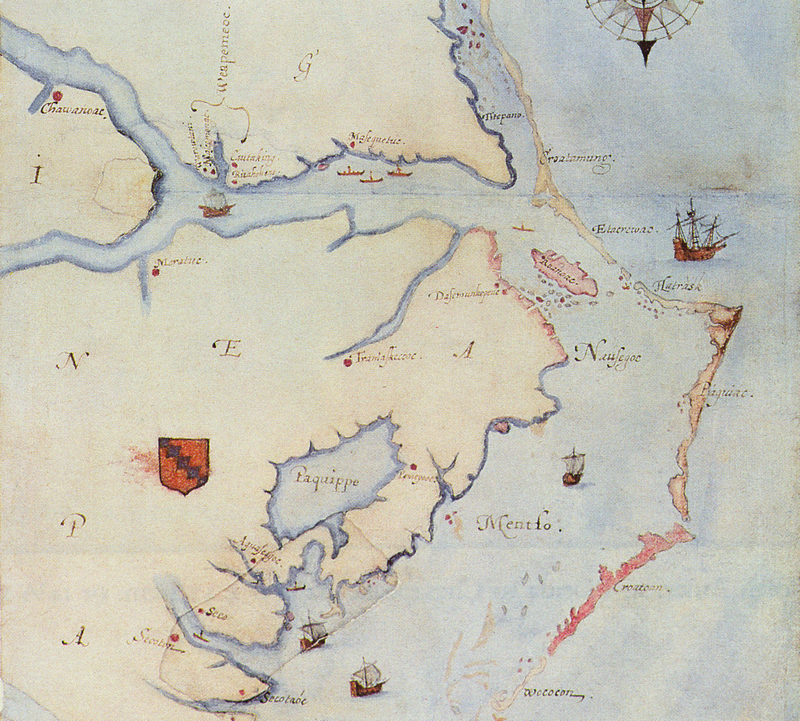 Indeed, later, at Jamestown, a map did find its way to the Spanish, so those concerns were certainly justified. Invisible ink was concocted at that time from milk, citrus juice or urine, and usually revealed by applying heat. The Independent reported that scientific tests were conducted by the British Museum’s curator, Kim Sloan, and scientist, Janet Ambers, following a request by Brent Lane, a professor at the University of North Carolina and a director of the First Colony Foundation, which conducts archaeological and historical research. I took the segment of the map shown with the fort in the Independent and attempted to reconcile it to the John White map we are all familiar with. It’s obviously not the same map. So, with a clue to one mystery, more questions are introduced. John White created two maps of the region during this period, one much more detailed than the other. 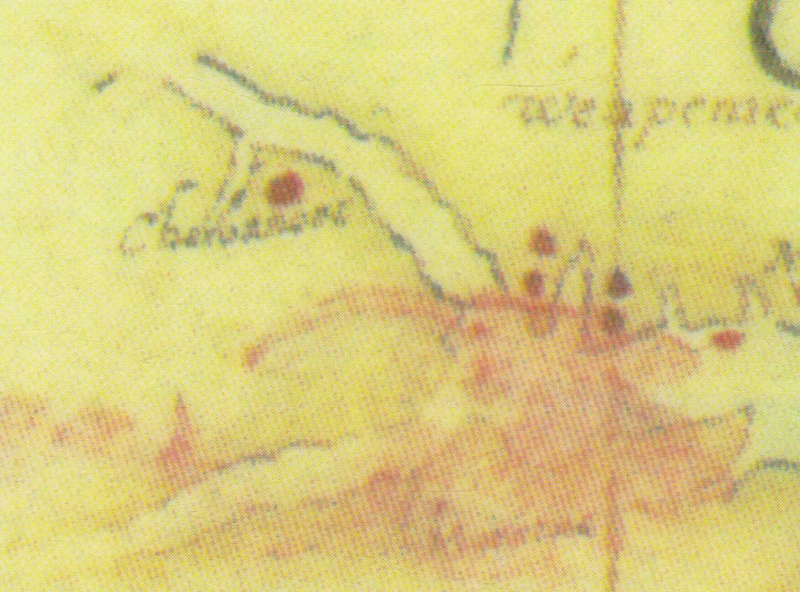 John White’s second map is the one with the patch. It’s obvious that this is not the same map as shown above. On White’s second map, shown above and below, the patch at the confluence of the Roanoke and Chowan Rivers is quite obvious, along with a second patch just below Paquippe, today’s Lake Mattamuskeet. Stay tuned as events unfold and more information becomes available. Map images are copyright the Trustees of the British Museum. This entry was posted in History, North Carolina, Virginia. Bookmark the permalink. 1 Response to Sir Walter Raleigh’s Lost Fort Found?